Order before 16:00h for same day delivery/pick up. A fresh, citrusy flavour. You'll sense it the moment you open a box of cupcakes containing at least one Lemon Cream Cupcake. Its light vanilla base is filled with cheese cream and freshly squeezed lemon juice. We use cheese cream for the frosting and top it with lemon jam. Ingredients: Cow's butter, powdered sugar, white sugar, cream cheese, eggs, white flour, cow's milk, vanilla essence, lemon juice, baking powder, salt, lemon jam. 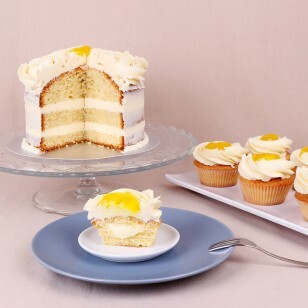 Check out our Promo Lemon Creme Cupcake Set with 6% discount. You can purchase this item by adding it to your selection. 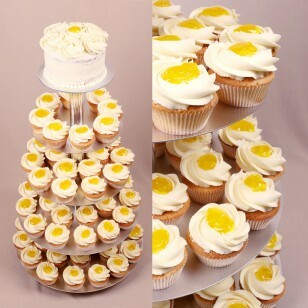 Minimum order quantity: 6 standard-sized or 24 mini cupcakes or muffins. Place your order by 4:00 PM to pick it up or have it delivered the same day. We deliver our cupcakes and muffins in Sofia. Secure and convenient online payments. Pay securely and conveniently with your VISA card using the Virtual POS of First Investment Bank. In case of issuing a refund, the sum will be refunded to the card, with which the initial payment was made. Pay securely and conveniently with your Mastercard using the Virtual POS of First Investment Bank. In case of issuing a refund, the sum will be refunded to the card, with which the initial payment was made. Pay securely and conveniently with your Maestro card using the Virtual POS of First Investment Bank. In case of issuing a refund, the sum will be refunded to the card, with which the initial payment was made. You need an ePay account (www.epay.bg) in order to make a payment. You can pay at every EasyPay office (no registration at EasyPay needed). After you make an order through our site, you’ll receive a 10-digit code which you can use to pay at an EasyPay Office. You’ll receive a step by step instruction how to make the payment. In order to process your order, you need to make the payment in advance. You can pay at every B-Pay ATM, included in the B-Pay ATM network. After you make an order through our site, you’ll receive a 10-digit code which you can use to pay at a B-Pay ATM. You’ll receive a step by step instruction how to make the payment. In order to process your order, you need to make the payment in advance. You need a PayPal account (www.paypal.com) in order to make a payment. Pay in advance the due amount with a bank transfer to one of our bank accounts. You can see the accounts of Take a Cake at the checkout. In order to process your order, please send a payment confirmation to contact@take-a-cake.eu. Mastercard SecureCode is a private code for your Mastercard account that gives you an additional layer of online shopping security. Only you and your financial institution know what your code is — merchants aren't able to see it. Verified by Visa works by asking for additional information either from you directly or by analysing data behind the scenes to see if the purchase fits your usual payment behaviour. Either way, you have the same level of security and protection. Your email will only be used for sending information from Take a Cake. © 2019 Take a Cake. All Rights Reserved. "Cookies" help us to improve our services. Considering the content of the website you agree with the use of "cookies"